There are about 500 nations in Australia each have their own stories and customs and each author’s writing is mostly of her/his own clan, consequently whilst there are several books for some nations, for others there are none. My hope was to find books on the two nations of our own area and the nation of my home town further up the Coast, I’ve looked before without success, this time I found one title. Restricting myself to one author per letter was difficult, so as to not leave anyone out I have an ‘extra’ list at the bottom. Some letters I was unable to find authors for. Do you know of authors to fill the blank spots or would like to recommend more authors? Ian Abdulla is of the Ngarrindjeri people and he writes of his childhood growing up on the Murry River in South Australia in the 1950s and 60s when Aboriginals had few employment opportunities and many families still lived on Missions. The Murray provided the Abdulla family with a source of food and cash and a way to live away from the Mission. A talented illustrator and author. Bronwyn Bancroft‘s books include delightfully illustrated alphabet books of Australian words. Our favourite is Remembering Lionsville about the author’s memories of growing up in country New South Wales. Bronwyn Bancroft is a descendant of the Bundjalung people, the Nation of my hometown and Lionsville belongs within the Nation where we are raising our children. Jane Christophersen is an Elder of the Bunitj Nation of Kakadu, Northern Territory. Our favourite book is My Home in Kakadu. The author, through the eyes of her granddaughter reveals the beauty of the six seasons of Kakadu as her family fishes, hunts and gathers. Gregg Dreise is a new discovery for us and we’ve yet to read, he writes of the animals of the Dreamtime, his illustrations look so promising. Gregg Dreise is descended from the Kamilaroi people in south-west Queensland and north-west NSW. He grew up in St George, Qld, near the NSW border. Sylvia Emmerton was of Kalkadoon descent and grew up in Townsville, North Queensland. To the best of my knowledge she has only written the one book, My Mob Going to the Beach. Chris Fry was of the Burarra people in Arnhem Land in the Northern Territory. One of his titles is Nardika makes a Spear, about a young Arnhem boy whose Father teaches him to make a fishing spear. Cathy Goonack is a descendant of the Wunambul people of the Kimberley in the far north of Western Australia. Scaly Tailed Possum and Echinda is a Dreamtime story of the Wunambul People. David Hardy is a descendant of the Barkindji people of Brewarrina in the north west of NSW. His books about Alfie are about family and friendships. Sarah Jackson in her book Tell Me Whys shares her own journey in exploring her identity as an Aboriginal child with white skin. Siblings and the children of Sally Morgan; Ambelin, Blaze & Ezekiel are descendants of the Palyku people of the Pibara region in the northwest of Western Australia. The have individually and collectively written several picture books and novels. A few of their titles are in our favourite pile. Diane Lucas is an ethnologist, she has worked as a school teacher and on research projects in Kakadu. We absolutely love her book Walking with the Seasons which observes the birds, plants and animals of the six seasons of the Mirrar people of Kakadu. Sally Morgan is a descendant of the Palyku people of the Pibara region in the northwest of Western Australia. She is a prolific writer and a highly identifiable Australian author. I read Sally Morgan’s poetry as a child and have been excited to introduce her picture books to my children. Sally’s books feature either native animals or people. Oodgeroo Nunuccal was a descendant of the Nunuccal people on North Stradbroke Island in southeast Queensland. Many Australians would be familiar with her previous name Kath Walker. Stradbroke Dreamtime was my children’s first introduction to her picture books, a collection of traditional Dreamtime stories from Stradbroke Island. May O’Brien was born in Laverton Western Australia and was removed to Mount Margaret Mission as a child. She has written several children’s stories, some are Dreamtime stories, some cultural. Melanie Prewett from Western Australia wanted to show that physical disability is not a barrier to true friendship. Her book Two Mates, about two boys in Broome who are best mates, one lad is Indigenous the other has Spina Bifida. Elaine Russell is a descendant of the Kamileroi people, in Tingha, Northern NSW. She grew up at Murrin Bridge Mission on the Lachhlan River near Lake Cargelligo in central NSW. Her books portray life growing up in the Misson; swimming, yabbying, fishing, school, the Church and school. Trina Saffioti is a descendant of the Gugu Yulangi people of North Queensland. Her most well known book is Stolen Girl, which gives insight and emotion into the lives of the thousands of young children who were taken from their families. A dark period of Australian History, the Stolen Generation. Percy Trezise wrote 30 picture books for children. We absolutely love all of his books that we’ve managed to find. Our absolute favourite are the Journey of the Great Lakes series; three children are blown on a raft away from home and have to make their way back through dangerous lands belonging to other peoples. Set around Cape York, the Top End of Australia prior to European settlement. Daisy Utemorrah a descendant of the Wunambal people in the Kimberleys, Western Australia. She has written stories of the Dreamtime. Nadia Wheatley well known Australian author has written several picture books. We highly recommend Papunya School Book of Country and History and Playground, both for the older child. Thank you Bron:) It hours of work of research, to the best of my knowledge it is the most comprehensive list. I tried many google searches and had to cobble a little from here and there. It was also important for me to list which region each book was set in, and now I too can click away requesting books from my library. 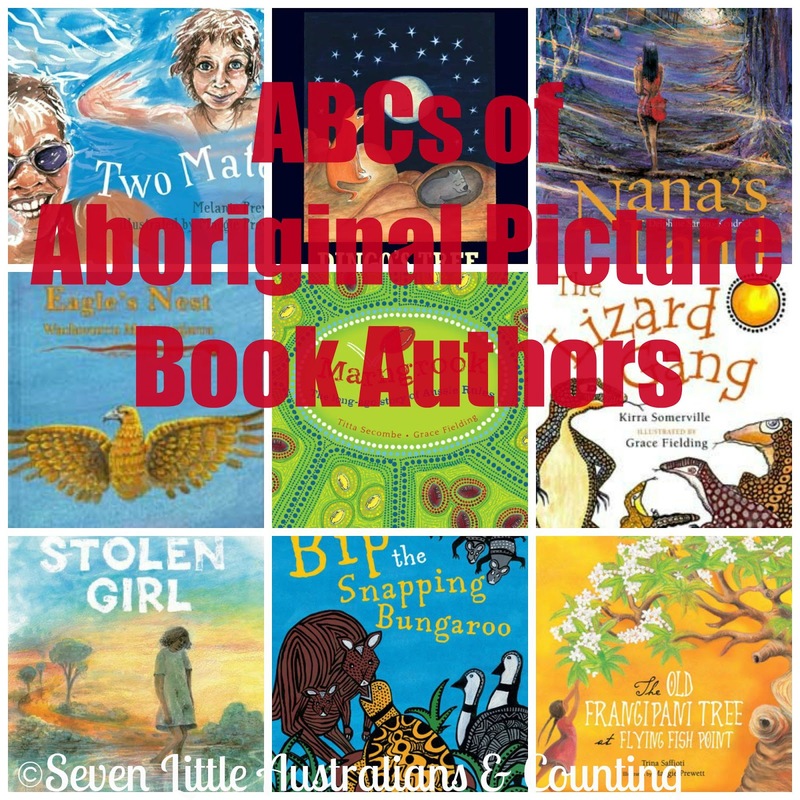 Stay tuned I'm also working on an Australian author ABC and slowly an Australian chronological history list in picture books. What an achievement! There are many amazing resources but sometimes it can be overwhelming as a parent and an educator. I love this list and I am picking my brain to try and fill the blank spots. So pleased we met the other day 🙂 Thanks, it was a list months in the making. Do let me know if you think of any blanks, really appreciate it. Carl Merrison wrote Black Cockatoo (Magabala 2018) which has just been noted in CBCA for young readers and shortlisted for Reading Children Book of the Year. It was also listed on Premier Reading Challenge NSW and Summer Reading Challenge 2018.